Guide courtesy of Team Golf Clash Tommy. This is an option in any situation except headwind. You'll need to either play way out to the right or long enough to take the trees out of play on your second shot. With the trees out of the way, you'll have a great chance for an eagle. This is a good way to play with the exception of a strong left to right wind. Use 3-4 bars of backspin, max left sidespin and full left curl. Land your drive on the small fairway and you'll be left with a perfect shot at eagle on your second shot. With tailwind you should try to go for the green. Use the small left fairway to bounce over the bunker and to the green. 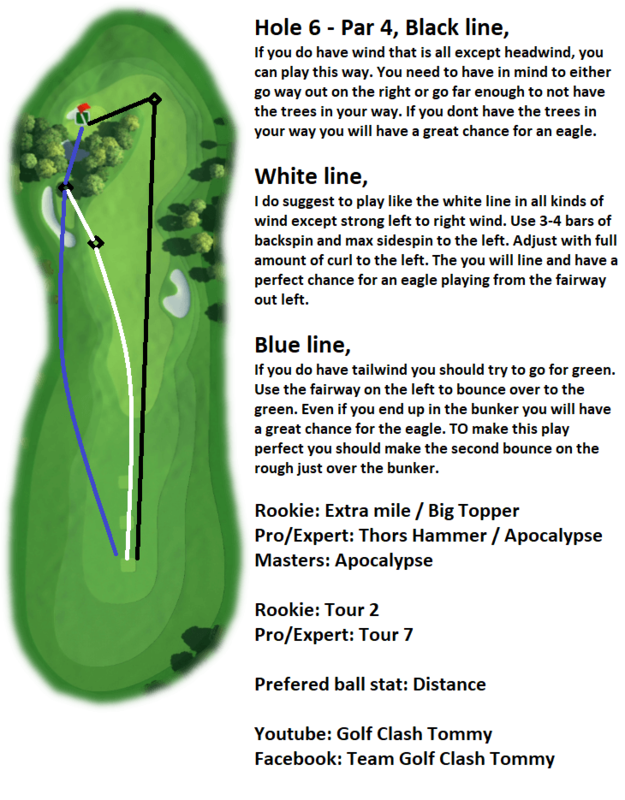 Even if you land in the bunker, you'll have a great chance for the eagle. To make this play perfect, you should make the second bounce on the rough just over the bunker.